Solar Impulse 2, a solar-powered plane piloted by Swiss aviator Andre Borschberg, is seen as it prepares to land while the ground crew follows on bicycles at Cairo Airport, Egypt, July 13, 2016. As I write this, Solar Impulse already is in the air on the last 48-hour leg of its remarkable journey: the first round-the-world flight by an aircraft that uses no fuel except sunlight. 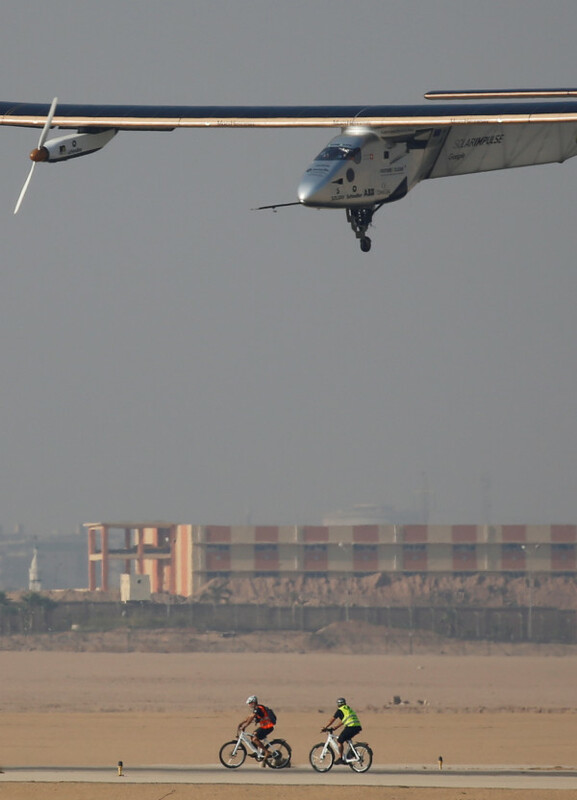 By the time you read it, pilot Bertrand Piccard probably will have landed in Abu Dhabi, to global acclaim. And you can’t help wondering, is this the future of flight? So electric airplanes that burn no fossil fuel would be very helpful, and Bertrand Piccard thinks this is indeed the future. “I make the bet that in 10 years we will have electric aeroplanes flying with 50 passengers for short- to medium-haul flights,” he said. But Solar Impulse, with the wingspan of a jumbo jet, can carry just one person. Photoelectric cells on the wings power it during the day and recharge the batteries that take it through the night — barely — but its average speed is only 75 km/hr, and it took 17 flights and 15 months to travel around the world, so we are still a long way from the Promised Land. You can’t just scale Solar Impulse up and get an electric-powered commercial aircraft that carries 50 people, let alone the 500 passengers that they can jam into a long-haul 747 or A380. The basic problem is coming up with light-weight, high-capacity “traction” batteries — ones designed to provide the main power for large vehicles for a period of hours — and progress on this front has been very slow. There are two other places it might come from. One way is by growing oil-rich algae in giant vats — salt water or wastewater will do — and crushing it to separate the oil, which can then be refined in the usual way to extract an octane fuel. ExxonMobil and Synthetic Genomics have spent $100 million on this project since 2009, but they still have much work to do in creating the fast-growing, high-oil-content algae that would make it commercially viable. The other way is by taking carbon-dioxide directly out of the air and using a catalyst to combine it with hydrogen to create an octane fuel. Several teams have working prototypes of machines that will extract the carbon dioxide from the air at a modest cost in energy, and the hydrogen can be obtained just by splitting water molecules. In both cases burning the fuel will, of course, produce carbon dioxide, but it will be precisely the same carbon dioxide that originally was taken from the air to combine with hydrogen or grow the algae — so the process as a whole is carbon-neutral. Because this approach would not require replacing or even modifying the entire 25,000-strong fleet of commercial aircraft, it is certainly more promising for the short and medium term. So congratulations to Bertrand Piccard and Solar Impulse’s other pilot, Andre Borschberg. Maybe we will have electric airliners one of these days, if only somebody can come up with the right battery — but in the meantime we should be working hard on making carbon-neutral fuel.